"Empire Earth: The Art of Conquest, also known as AoC, is the official expansion pack for the real-time strategy game Empire Earth. Art of Conquest was developed by Mad Doc Software, and was released on 17 September 2002 in the United States. 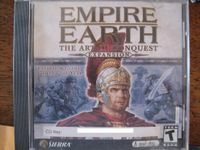 The game was released in Europe later in the year, and the following year in Japan.The Gold Edition of Empire Earth, which features both the original and the expansion, was released on 6 May 2003. Art of Conquest added several new features to the original Empire Earth, including new units, new civilizations (Japan and Korea), civilization powers, and new hero units. Art of Conquest also features three new campaigns: Ancient Rome, World War II, and 24th Century Mars." Source: Wikipedia, "Empire Earth: The Art of Conquest", available under the CC-BY-SA License.